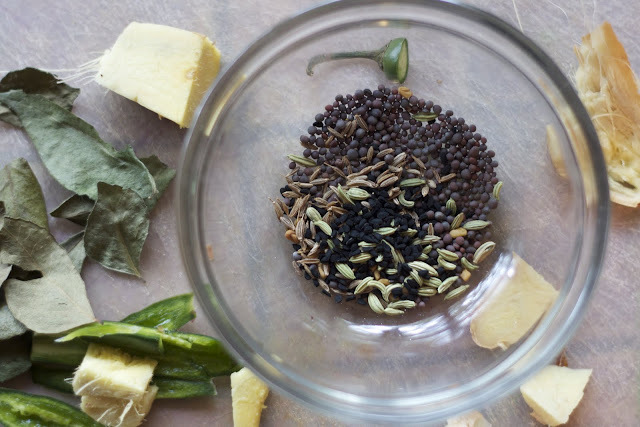 The Colors Of Indian Cooking: Break Your Oil Dependency. Eggplant, Done Lighter. Break Your Oil Dependency. Eggplant, Done Lighter. One of the questions I'm asked by people most frequently is how/why the hell did you start cooking Indian food? Like a lot of love stories, it's complicated. There were actually a few reasons for me to dive into a cuisine that on the surface was quite outside my comfort zone. As a kid I was a picky eater. In fact I was beyond picky, I basically didn't eat. 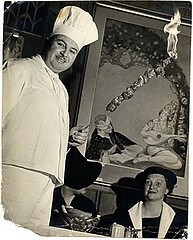 The food I was offered on a regular basis (unless eating Italian at Nonna's) was fairly ordinary and typical of the times. TV dinners, fish sticks or frozen pizza on Fridays. Meat always served triple well done, mac and cheese from a box. 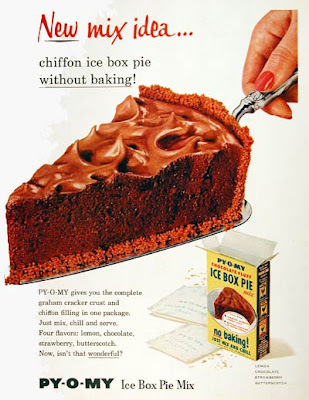 However these very American meals were always augmented by either a fresh salad or a steamed artichoke as a first course - I was the only kid on my block who was eating artichokes at that age - and sometimes featured an exotic cheese for dessert unless we were having Py-O-My..
"It's not a pudding it's not a cake it's....Py-O-My Pudding Cake." Just ask any Soupy Sales fan about it. Warning: Any food item that is described by what it's not... be afraid, be very afraid. ...and sampling Havabour, lamb shanks and rose petal jelly at Omar Khayyams. When the first Vietnamese restaurant in San Francisco opened I had to try it. 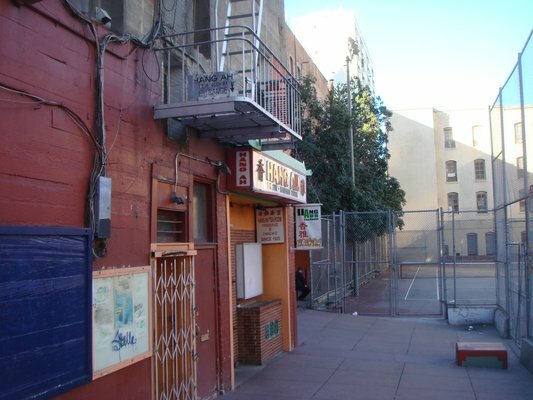 I vividly remember creeping into the spicy darkness of the Taj of India restaurant, now long gone, and sitting by myself in a large banquette, ordering my first ever Indian food. I had gotten a coupon somewhere, I must have been 15. What do I remember about the meal? Only that the flavors were new, strange and amazing and the giant Bengal tiger head on the wall above me. So there was that. Another thing that pushed me in a Vedic direction was getting cancer 21 years ago. I'd been a vegetarian, healthy, never smoked etc. but still I got sick. Along with chemo and all the rest of Western medicine, I decided to move in a macrobiotic direction. I quickly became bored with my food. I mean how much burdock root can a person eat? And to deny an Italian eggplant?? Criminal, I thought. It was then that my doctor suggested I try an Ayurvedic style diet. In other words, how about Indian food? My sister in law who is an Indologist and had lived and worked in India, stepped in with books and info and I was on my way. I recovered but I didn't stop cooking Indian food. It was as though something had clicked between my brain and my tongue and it didn't matter that I'd grown up on a weird tightrope between pickled Italian pigs feet and Kraft Mac and cheese It didn't matter I had grown up as fart from India as one could get in oh so many ways. I was home. I had found my cuisine! One thing I learned when I first started eating Indian food, let alone cooking Indian food, was the vast amounts of oil or ghee that were sometimes involved. Not that grease doesn't set my taste buds blooming as rapidly as the next guy. It's just I always feel guilty eating too much of it. There is this nagging thought in the back of my head. "This is killing you dummy!" So that was one of the main reasons I started cooking Indian food myself was the desire for the flavor but without all the grease. And so I set about adapting the recipes I came across in an effort to make them lighter and healthier. I experimented to find the right balance between how much oil is needed for flavor and how much is just...well too much. My friend and cooking mentor Paula Wolfert has taught me some great tricks about eliminating excess fat and grease from foods while still keeping the flavor, but there are times when just a culinary maneuver won't do. There are times when one has to "Just Say No!" So what would you do with a recipe that has 1 quart of oil in it's first line? Whoa! 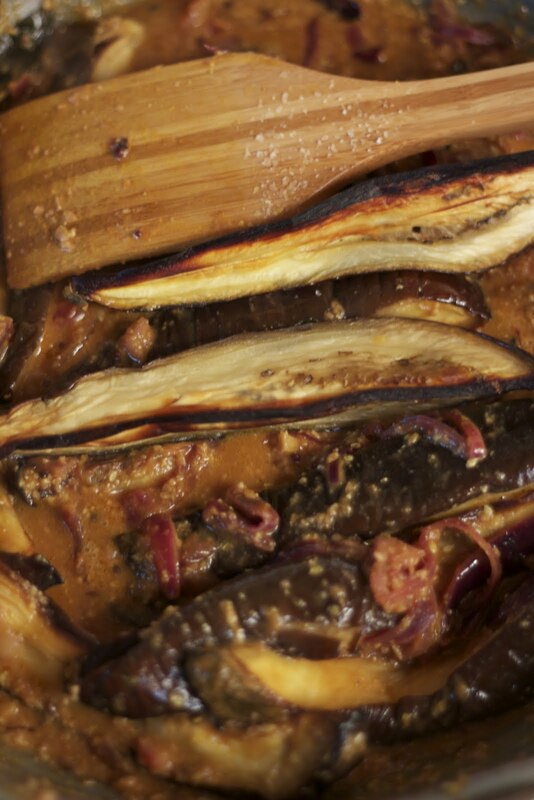 Here's what I did as I adapted the classic Indian recipe Eggplant with Peanuts and Sesame Seeds. 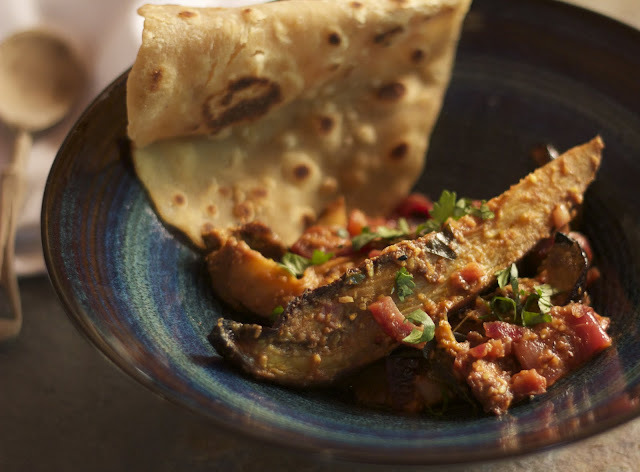 Traditionally this dish is made with brinjals the tiny little oval Indian eggplants. 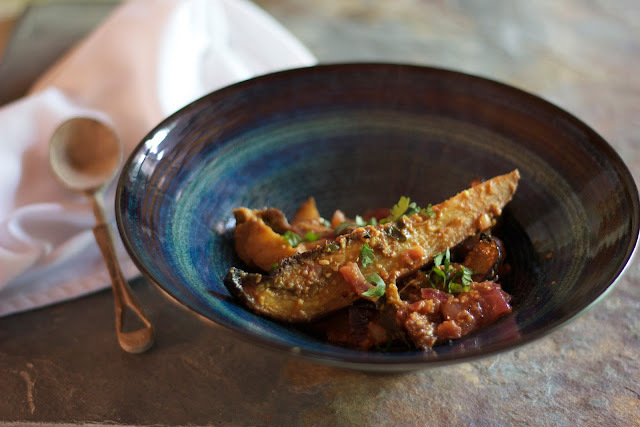 However, here in Sonoma I had no such luck, no little brinjals, and I wasn't up for the 50 mile round trip to fetch some, so I decided to use the larger oval Italian-style eggplant found in every market. They worked just fine. Just purchase the smallest ones available. 2 to be exact. Also, about that quart of oil thing? Instead of frying the eggplants, I decided to hold the oil and oven roast them. Wash the eggplants and halve them. Then quarter them and quarter them again. Spray a cookie sheet with non stick spray or brush it lightly with vegetable oil. Place the eggplant pieces on the cookie sheet and brush them lightly with vegetable oil. 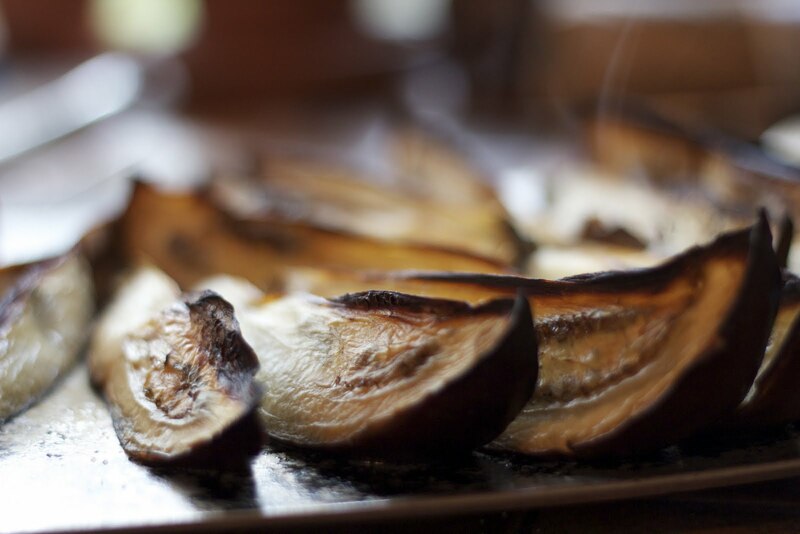 Pop the eggplants into the oven and roast them for between 30 to 40 minutes. When they're tender and roasted, take them out and set them aside. Saute them until they start to turn golden. 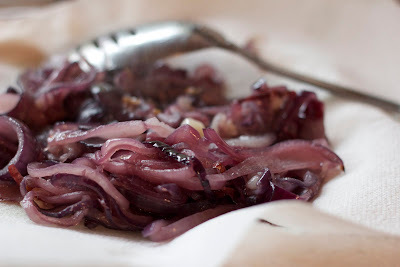 Take the onions out and drain them on a paper towel and set them aside. Dry roast each of these until they start to turn color or get aromatic. Put the dry roasted ingredients into a blender or spice grinder, add 1/2 cup of water and blend it all into a paste. Let everything cook down for about 4 minutes. Bring it to a boil then add in the eggplants. Cook for about 4 or 5 minutes and serve it up! With a chapatti and some spinach on the side, lunch is served. The dish is a tasty blend of the sweet and tangy, and who doesn't like that? It's even better the next day, which is always a good thing, but keep your eyes on it. It has a way of disappearing. I also have to confess while eating this I had fantasies of taking the eggplant and using it as a pizza or flat bread topping. In fact I'm pretty sire I'm going to try that. I think it would be outstanding. 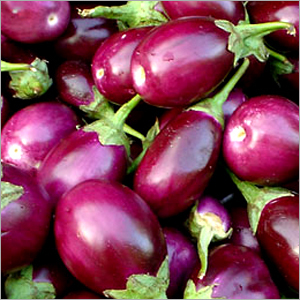 This really looks fabulous and I love eggplant nice change of the usual! These are definitely done right! Love those little eggplants! This sounds absolutely delicious with all those spices. I am with you on the usage of oil in some of the dishes. I use as little as I can get by and so my curries are not as red or brilliant as they should be when the oil floats to the top. I figured I can do without that and looks is not that important. Can you come up with a way to get less fat in my hog jowel dishes? I love this recipe of yours..Even the paratha/ bread with the aubergines look so inviting...I wish I had made this for dinner tonight ....looks very yum and is guilt-free too! Great recipe. 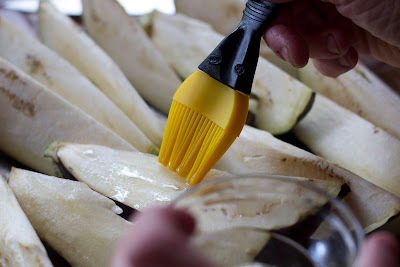 For me eggplant is more luscious and appealing when fried. Whether in olive oil (Mediterranean) or peanut oil (asian). YUM! I love Indian food and on the weekend had some friends over for a full-on Indian meal...all were very satiated at the end of the evening and the house smelled of spices.